Annual RAMP-A-THON kicks off at our ADA Celebration! opportunity to be a vibrant part of their community. Meet Patricia . . .
stairs, four steps presents a significant barrier. Patricia often needed to be carried out of her home, and the lack of access created a significant safety hazard in the event of an emergency. 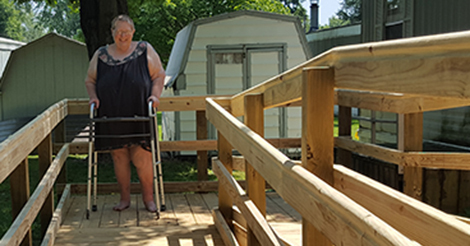 Disability Network coordinated volunteers from Harbor Habitat for Humanity and funding used from our Ramp Up program and St. Joseph-Benton Harbor Rotary Foundation to build a ramp for Patricia so she can now independently come and go and feel safe in her home.